The Big Dig 2017 took place at Studfold Farm near Lofthouse between 3rd and 7th July. 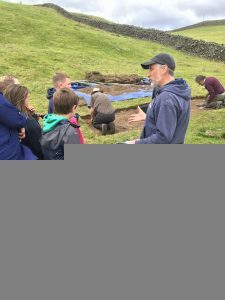 It was led by John Buglass of JB Archaeology Ltd and 21 volunteers took part during a very enjoyable week long excavation. 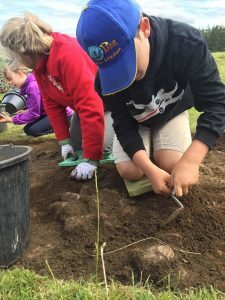 In addition to the volunteers, 68 children from three schools visited the excavation, taking part in archaeological exercises, gaining hands on experience of an archaeological dig and experiencing the Studfold Trail, courtesy of our hosts Anne Challis and Ian Walker. Studfold Farm is situated in a beautiful landscape with a rich and enigmatic history of human activity which reflects historical developments in Niddderdale and beyond. 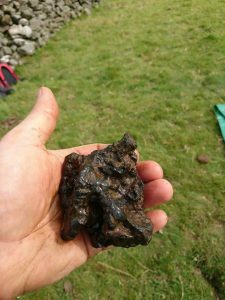 It is the site of a recently discovered Romano – British settlement and a string of ancient field systems as well as a former Byland Abbey Grange and an array of industrial activity including mine shafts, quarries and lime kilns. The excavation looked to investigate a possible Iron Age settlement. Ultimately the results were inconclusive, although the small number of finds which were uncovered may lead to a surprising and important new discovery on the site. We would like to say huge thank you to Anne and Ian for their generosity in allowing us carry out the excavation on their land.